In this article, I will show you how to immediately stream DVDs to your Apple TV with the help of AirPlay Mirroring. Many people have a lot of DVDs (technically, the specification is called DVD-Video). You probably know the VIDEO_TS and AUDIO_TS folders with the VOB files. The problem is: This format is not compatible with your Apple TV and can’t be streamed directly via AirPlay. So you have to re-encode it first (for instance with Handbrake, an open source video transcoder). And to cope with protected DVDs, you can turn to Pavtube DVDAid for Mac or BDMagic for Mac to help you easily convert DVD files to playback on Apple TV on Mac with just a few clicks so that you can play DVD freely without any external tool. But since re-encoding takes some time, needs software & know-how and eventually some space on your hard disc, here is another solution. Here’s my hardware. 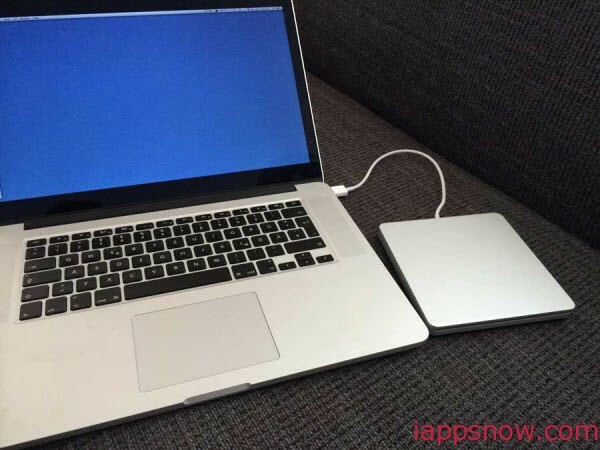 Just a common Macbook Pro with the Superdrive (an external USB CD/DVD drive). But you can use any another Mac with DVD drive, as long as it is compatible with AirPlay Mirroring (Mac requirements for AirPlay Mirroring). The first thing that comes into your mind is probably using the DVD Player Software that usually opens when you insert a DVD. But this won’t work and will just show you the error message “The viewer could not be moved to selected screen.” Why? Seems like a copyright thing that it’s just not legally allowed and therefore suppressed by Apple. Enable AirPlay Mirroring and make sure that you see the VLC window on your TV. Double Click in the video window for fullscreen and start your movie. Here we go… video and audio is streamed to your TV. Just in case if there are any performance troubles: Here are some Tips for improving AirPlay Mirroring Performance. I haven’t tried this for Blu-Ray disc (because I neither have a drive nor discs) but I think this should work for Blu-Ray, too.